and we make into cartoon tshirts! Can't find fitting clothes for your beloved one? Ever wonder how your cute doggie(s) will look like in a cartoon version? 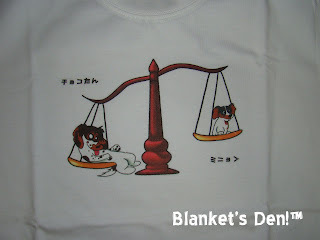 Have your beloved doggie(s) cartoon drawn on tees! Need a new tee but unsure of a design/pattern? Want to have same outfit with your doggy? Why not remake clothes sleeping in the closet into new trendy outfit? Just tell us what you need!! Interested ones can always email us! 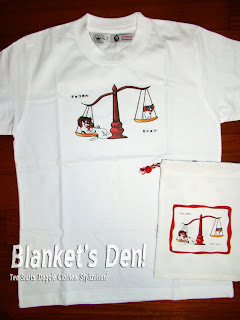 ※Name your subject as "Blanket's Den" (type down the item name here) so we would not delete(so many junk mail...><). The tagboard is just there! So put down your name, give us your email! If you are unsure of anything please do ask. We do not want any miscommunication!. Address will be given through email after orders are thoroughly confirmed. Payment must be made A.S.A.P. Account number will be given through email after orders are thoroughly confirmed. Payment must be made within a week. If there are any errors, do inform! once sent it's very difficult to cancel, so don't change your mind! »when orders are given it would take about 2-3 week befor delivery. »we seek your understanding and hope to be of service to u.